Canyon Entertainment Group, known for representing up and coming artists, is using their knowledge of music and the music industry to help aspiring kids and young people achieve their dreams. The Academy has already had great success with the formation and skyrocketing praise of the all-girl pop-rock group, Girl Pow-R.
Canyon Entertainment Academy has been launched to fill a gap in the training and education of young musicians and singers in their quest to becoming true artists and professionals in the music industry. Today, Canyon Entertainment Academy announces the opening of their new school which has been launched to fill a gap in the training and education of young musicians and singers in their quest to becoming true artists and professionals in the music industry. For years, most music and vocal teachers have had a very mechanical and ‘by the books’ approach to teaching aspiring artists to sing or play an instrument. And, there has not been an integrated school to bring this together through Performance Training. Canyon Entertainment Academy is here to fix that issue by having passionate teachers and a curriculum that allows students to not only learn about music from those who love their work, but students will also learn how the music industry works from people who represent independent music artists. 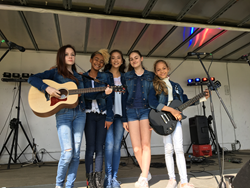 Canyon Entertainment Academy wanted to create the Academy after the success the company has had helping to form the all-girl pop-rock group Girl Pow-R, which is a group of talented young women from ages 11 to 16 whose first original single “Krisi” debuted on November 24th, 2017. The girls have toured all across Ontario performing over 65 shows in 2017, and they also have a full-length music video shot entirely in Ontario coming out in early February 2018. This shows what talented young people can accomplish with the teachings that Canyon Entertainment Academy provides, along with dedication, practice and the proper resources. The Academy’s program allows for the student to participate in a variety of different sessions to work one-on-one with one of the talented teachers with deep industry experience, to learn how to play instruments such as guitar, piano, ukulele, violin, or brass instruments, as well as vocal training. Beyond the instrument and vocal instruction, the Academy also offers a 16-week Performance Training program consisting of 6 graduated levels to help students learn how to put their musical talent into practice. Canyon Entertainment Academy also offers courses in song writing and music production and recording. All of this passion and talent means that the teachers at the school are enthusiastic about their work and are looking forward to teaching current and aspiring artists who are equally excited about creating great music. With the knowledge and expertise of the teachers available to all students, any person between 5 and 25, with a passion for performance, can be the next award-winning musical artist. From the creators of Girl Pow-R ( http://www.girl-pow-r.com), we are embarking on the next phase of our journey to build confidence, experience, and top-notch Canadian talent. Not everyone will make it, but we are a first-of-its-kind school to help you get there. Most of all, you have the SPARK to work hard and grow! We are here to empower girls and boys, women and men, to make a positive change in the world. We are focused on young artists ranging from ages 5 to 25. And, the result of your training will be that we will form you into various bands to perform across the province. This is when you move into our full Artist Development program, writing and performing original music, with distribution through our record label. But first, at Canyon Entertainment Academy,, we train you in ‘everything’ you need to know to succeed. From vocal instruction to playing an instrument (e.g., guitar or drums), as well as performance techniques and song writing, and on to branding and social media.